Transformer (Kazakhstan) is an exercise in observation, focus, anticipation. It demands a state of alertness to appearances, to know what is important. 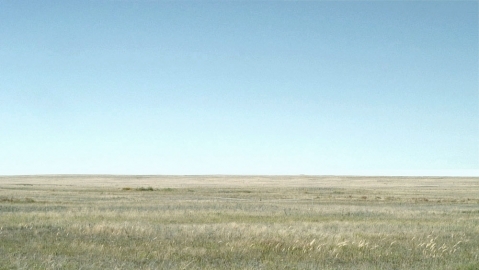 It defines the scale of differences: what is scrutinised when the field of vision is static – barely discernible breeze, lack of cast shadow, unmappable and unremarkable variations in contour – contrasted with what is grasped at with every change of shot – an immediate and vulnerable attempt to ascertain the scale of the landscape, the nature of threat where 'animal' is absent, vain measure of time (interval, duration). A controlled explosion. A plume of pale smoke fixes our gaze, the formless mass lifts away from its source, begins to disperse, travels towards us, continues to drift beyond our position. Beneath it, the smooth movement of its shadow crosses the ground, dark, untextured, seeming to have more substance than that which it follows: seductive, distracting, treacherous. Where or what is the fixed point? What follows? As audience, we seem to occupy an unknowable position, both subjectively and politically. Wheel (Ecuador) elaborates on this relationship between the viewing subject and the object of sublime apprehension, recalling Ingmar Bergman's definition of 'the theatrical space [as being] that charged emptiness from which all magic would occur.' A mythologised rite that could precede or precipitate some other action or rite, redolent of folk-tellings of liminal journeys, some unspecified rite of passage. There is an element undisclosed – a deity perhaps, or hero, or unwary traveller who as subject might complete the narrative. 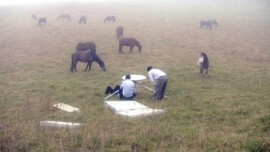 Wild ponies contemplate the quiet actions of three men in their shirt-sleeves conveying bundled elements of some structure – which becomes a circular base on a tripod – this time through intimately variable topography. 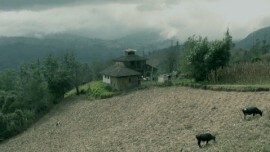 Locations shift, the track towards a farmhouse, a clearing in a forest, a cornfireld, open grassland – these are archetypal settings, each with a myriad associations for what might follow. The element of neutrality, unpredictability and the staging of myth that transgresses the notion of three-dimensional space and linear time, (as Lyotard(1973) perceives the disturbance created by a physically apprehensible 'sblime') is here amplified through sequential though unresolved actions.